I am writing to raise awareness within the local community of Carina and surrounding suburbs to the growing unchecked development of large residential unit blocks in the area. And am hoping that with some awareness we can gain community support to stop it. We recently purchased a house and moved into Carina and love the street and suburb. We knew that the street we moved into (and surrounding streets) was zoned to allow for low to medium density housing. Whilst we did not know exactly what that meant, we walked the street and surrounding streets to get an idea of the types of developments that were taking place. In the majority of cases they were tasteful, 2 story developments across 1-2 blocks with 4-8 very tasteful townhouse style residences built on it. When we moved in we knew that a number of developments were in the pipeline or about to commence on Dickenson street. We assumed they would be something in character with the townhouse style developments already existing. Once building of 2 of those developments started, it soon became clear that this was not the case. The developments, about 100 metres apart, cover the entire blocks they are on, coming within 2 metres of boundary fences, and are 3 stories high. So they dwarf over adjacent properties’ back yards / outdoor areas. They will have up to 15 residences in them. Our initial reaction was that these 3 story blocks seem out of character with the developments that had taken place over the last 5-10 years, but what could we do if council has approved them. 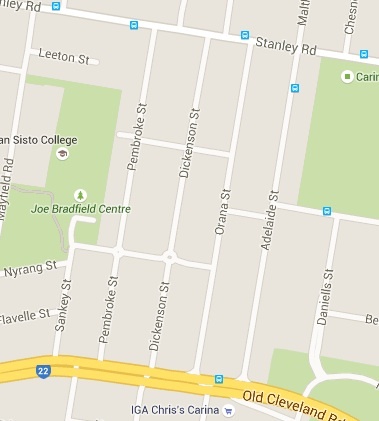 Location of Dickenson Street, Carina. Then in April (during school holidays when many people are away) we received a notification that there was another new proposed development application in at council in Dickenson Street, next to one of the 3 story developments already being built. On looking into the application on BCC’s website, we were dumbfounded to see that this was a proposed development completely out of character with the street, surrounding street and the whole suburb. It was to be 3 stories high and cover 4 blocks of land and would contain 33 one and two bedroom units. So this will mean approximately 60-65 new residences (with multiple residents / families in each) within a 250 metre stretch of Dickenson Street (the section bordered by Edmond and Bruce Streets), along with 2 more proposed developments in the same stretch on the opposite side of the road (size not yet known). One of our neighbours then organised their own petition completed by another 50 residents around the area objecting to the development. We have met with Councilor Ryan Murphy who has made clear that he is not supportive of this large scale unit block development and has assisted us to put together an online petition and will be writing to residents of the area to continue to rally support against it. From discussions with local state and federal MPs it is clear that development such as these are increasing across many areas of Brisbane. This was picked up and highlighted in a recent program on the ABC. As far as we can gather the BCC building rules around height, boundary distances etc. that are in place appear to be more “guidelines” that developers can get around quite easily. So while this may seem like a one off development, once one of these large, out of character unit style developments is approved by council, other developers will see the $$$ signs and do the same all across Carina and other suburbs that are similarly zoned, with council not being able to stop it once the precedent has been set. So I urge readers / local Community members to complete the online petition when Councilor Ryan Murphy writes to them to register their objection to the Dickenson Street over-development to send a message to council that we, their ratepayers and voters, are not happy with what is happening. In the meantime below is the petition our neighbour circulated locally. People can print, complete and return it to the address in the petition. They can also email their local councilor and State MP to express their views on the issue. Many of the community will remember that Whites Hill Reserve came under developer attack not long ago. The local community rallied and as a result the reserve is still there. So we can make a difference when we rally together to ensure that our community retains its character and feel for our children. I agree with majority of comments. How often do residents actually get to comment on a proposed development? Very rarely are signs posted anymore. Parking is an absolute nightmare, as is trying to navigate what is supposed to be a 2 way street. Poor garbos, I don’t know how they cope! Let’s have some development of single level houses that will allow people to stay in them when they are older, rather than all of these multi storey developments. BCC is very short sighted when it comes to retaining the uniqueness of Brisbane and its heritage housing and planning for the future, especially for elderly residents. There is no quality control over developments and I don’t know why we pay, inspection fees for new properties. My relatively new place has been fitted with electrical cable that has been recalled by the ACCC. Where was the quality standard check in relation to this. Come on BCC and developers, stop being so greedy and shortsighted and start listening to what the community wants, rather than thinking of filling your own coffers. We are owner occupiers of unit in Dickerson St. It was our expectation to have similar units mixed through the area. A Unit complex of 33 units is not in character with the established area. I agree with long term residents, we love the area and want it to be a place to live for many years to come. If you build then there must be enough parking for the residents off street. It is all about developers making money. I’m in Pembroke street, and have seen many quality houses bulldozed down to make way for units..some of them absolute eyesores! I can’t drive down Pembroke street any longer. It’s wall to wall cars. Plus the dust, noise and dirt coming from the building sites…weekdays and weekends. Plus I am constantly receiving mail, phonecalls and visits from Real Estate agents wanting me to sell. I’ve even been approached by developers wanting me to sell and what they’d build on my property, offering me the “best pick” of the units to be built. I grew up in Carina and I love this suburb. It’s sad to see it become a concrete jungle. As a local developer with further interest in the area I am puzzled when reading the article and comments in both this and another local paper about this development. Brisbane City Council have a set of guidelines which all developers must follow in regard to the building height in proximity to neighbouring properties in each zone rather than specifically the number of stories it is. For a proposal to be this far though the development process the building would comply with these and this article is just another example of people using incorrect statements to try and win an argument. Land prices in Carina’s LMR2 zoned areas is at a record high and with many residents being aware of this they have bought up to cash in as capital growth rises further. With the exorbitant pricing, small projects become unviable with affordability of the final product on the forefront of the buyers mind. Developers simply work with supply and demand and are experts at creating a product to suit the demographic of the market and with affordability for first home buyers and middle income workers being a hot topic of late there has to be a solution, larger scale developments create this by absorbing the land cost and keeping the price lower. Through my experience in the area the buyers of units in larger complexes like the proposed Dickenson st project are the Leisa’s of our community; mainly young first home buying females, young professional couples, middle age divorcees and the elderly all of which desire to live in close proximity to public transport and the city but are unable to afford the $600,000+ house prices. If the area remains as an aging community with the residents denying growth the whole community with become stagnant. There was a comment made recently that more densely populated living arrangements (i.e. units) brought about unsocial non-community based residents but I could not disagree more. Allowing a younger demographic of home owner brings a fresh spirit into the community benefiting local shops, cafes and businesses thus creating a vibrant community for everyone to enjoy. You cannot help but notice how Carina comes alive on a Saturday and Sunday morning with boot camps in local parks and others exercising as well as local cafes brimming with patrons. Now that is a highly functioning community!! Unfortunately our city is growing and traffic congestion is becoming a problem. But don’t you think that creating more apartments around major public transport is a more educated approach to resolving traffic congestion then people driving their cars and polluting our air. If you are not aware developers are required to contribute millions of dollars to Brisbane City Council to not only upgrade all the aging services throughout the area but also to create beautiful local parks and upgrade bikeways which you the public enjoy. I think it is best to seek correct professional advice before making comments on issues that you are obviously trying to mislead the public and other residents to believe. Carina has recently had houses destroyed that were or should have been on the heritage list because they were turn of the century homes. I am dismayed and angry at the aggressive nature of these developers that don’t give a damn about local history and the local residence. I have lived at the same address in Carina for the last 60 years and cannot believe that they are allowed to without notice, bulldoze entire heritage homes. Disgusting act of vandalism by anyone’s standards and the person’s responsible should pay the price for such an act regardless of there standing in OUR Community. I would like to discern the Eastern Busway from Coorparoo to Capalaba via Carina and Carindale is yet to be confirmed and subject to funding. 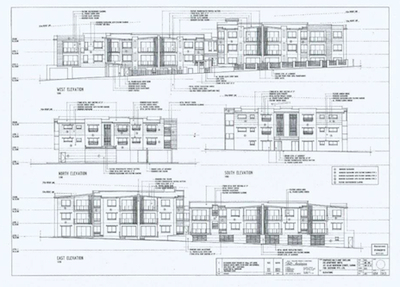 So why do we still need medium density housing when this busway plan is scrapped? I would also like to reiterate Dan Rumsey’s comment on off street parking. If anyone is interested, please do come and visit any streets here during the weekday morning and compare it after evening. Where do these vehicles owners come from? Don’t you think that creating Park and Ride first to resolve this issue? Understand that people struggles to get into the housing market closer to the CBD, but have you seen how many of these newly developed apartments style are actually bought by investors and up for rental? So are these affordable “housing” helping people to get into the housing market or it is just a mere opportunities for the developers? I do not think we are denying growth in Carina but you’d just need to get your priorities right first. Overdeveloping Carina making the residents living here unsustainable. Why do we have to cope with this when the infrastructure aren’t available yet? Antony and Wayne – your comments are so self-serving that they are laughable. Successive Council’s have approved overdevelopment in Brisbane for many years – and profited from it. They sneakily changed low and med density housing to multi-residential and heritage preservation requirements in order to allow developers free reign in this area. If you are so concerned about the lack of housing in Carina, then why are developers destroying the houses instead of moving them to removal home sites for resale. Also when did a unit price of $500,000+ become cheap and viable for any homeowner – I wager that the majority of units built in Orana, Dickinson, Adelaide, Pembroke and surrounding streets are sublet as rentals, not owner occupied, due to the high cost. Plus, with only one carpark per unit and probably two+ drivers occupying units, the streets are overcrowded with parked vehicles 24/7. I live next door to Elizabeth and fully support her comments… My family have lived in Carina since 1929. My grandfather jointly owned 20 acres on Stanley Road which he was forced to sell during the depression – he wasn’t a developer; and he also owned the four blocks that Elizabeth, myself and the neighbours either side own. I have lived here since 1952. Carina was still a farming area after WWII. The only reason that you are getting a toehold in this area is because of an aging population. Here’s an idea – why don’t you and your developer cronies live in your poorly designed units for a while and see how you like progress. Ugly units aren’t progress – they are just ugly. The homeowners in this area are fully aware that overdevelopment is happening because we are bordered by two arterial roads. You aren’t doing anyone a favour except yourself in building units that you are selling at inflated prices. You won’t be satisfied until you’ve turned the area into a concrete ghetto and destroyed every bit of history and beauty. No-one believes you are building the units out of altruism. The unit dwellers will be bombarded with offers from Real Estate agents for free valuations, which will probably be less than they paid, and they’ll get a taste of what the rest of us have put up with for years, i.e. that homeowners are nothing but cash cows for developers and estate agents. Not in my back yard!!!! This area of Carina is predominately built up of units. You purchased a house in a location which has been classified for low to medium density residential units for well over 25 years. This is not something new. This location has maintained the same zoning. It has been strategically zoned LMR 2 and 3 storeys mix as it is an ideal location for Multiple Res. This area is within 400m of old Cleveland Rd which is a high frequency bus service and will have the Eastern Busway Services which goes to and from other transport nodes and the CBD. If you did not want to live next to Multi Residential apartments why did you purchase in this location. A simple drive down Dickenson, Adelaide, Pembroke St clearly illustrates this is a Multi Residential area full of apartments. You cannot ignore/miss the 3 storey apartments on Dickenson Street. It is a bit rich to argue the development is unprecedented when it clear is not. Housing affordability is a hot issue at the moment the only way this can be addressed is we must build more cost effective forms of accommodation. Yes this means increased density. Everyone would love to live on 600m2 block of dirt within 5km of the CBD, but the reality is this cannot happen. If we do not develop areas intended to be developed like Carina, we will be in an identical position to Sydney within 10 years, and the next generation of individuals will not be able to purchase any property. Re June 16, 2015 – Wayne says that “Carina is PREDOMINATELY BUILT UP OF UNITS” What a load of Crap ! There are far more houses in Carina than units. Having said that, no one can dispute that right now our lovely suburb is undergoing a rapid change. Some would say for the better and others would argue the point. The problem that I am having is the fact that no one ever seems to get a say in what is happening. Example — when your next door neighbours house disappears overnight or worse still when a local turn of the century home in very good condition is completely bulldozed and carted away to the dump all in 1 day. I could not believe my eyes when I went passed. That house had stood proudly there for generations. I knew the original family and still know remaining family members today. New residents in Carina probably don’t care about the history of our suburb. Well I could rave on for hours about the local history and my own personal experiences of living here all my life. Seeing it change from a peaceful and predominately bushland suburb to a noisy and over crowded and busier place to live. My biggest gripe is the fact that we are and already have lost some of our magnificent trees. If this type of redevelopment is allowed to carry on then Carina will become a wall to wall ghetto which will become a haven for the worst type of persons to live in. Over development is destroying not only the environment but also our community ! What about single people or couples who are struggling to get into the housing market . It’s hard to afford anything closer to the city . The council know this and are aware of the population forecast and this is why they zoned this area near the proposed busway ( which will be great ) if you purchased your property based on your own assumptions and have regrets please don’t take it out on those who are looking to buy an affordable unit in a larger complex . If the complex is bigger it will cost less to build than 2 neighbouring complexes surely . Then the builder can pass the savings on to people like me . I understand you are all considering yourself as am I . Please contact Brisbane Residents United and jopin with them in working together to address innappropriate development in Brisbane. They have a FACEBOOK page under that name. It is this kind of ‘planning’ that results in urban sprawl! Focus on developing areas within walking distance (and where public transport infrastructure already exists i.e. Wooloongabba) rather than putting pressure on areas that have been over looked for decades (both bus and trains). And I don’t see any consideration for inclusion of additional public green space – without breathing space the suburb will ulitmately become a slum of disconnected people. BCC has a lot to answer for… short term gains in the added rates revenue will only come back and bite hard in the long term. We agree entirely with Angelique. These councils are creating a proverbial minefield. It appears that short term greed has overcome any sanity in the planning area, and it will cause many problems in the future. We already have many problems driving down our street at the weekend, and buiding is only in it’s early stages. And what about garbage collection, I already feel sorry for these guys on collection days. Please get your act together BCC and give some thought to the future. This suburb does not need units like high density style. Leave our suburb of Carina and surrounding areas alone .